Today and everyday about 94 babies are welcomed into the world in Western Australia. 84 of them will join their parents and families at home in the next few days, 2 of them were born before 32 weeks gestation and are in for the fight of their life, 6 of them were born between 32 weeks and 36 weeks, a further 2 will have been born full term but sick, a path their parents no doubt thought they would not be travelling. Click to download for printing. We would like to invite you ALL to join us in raising awareness throughout November as part of 'Neonatal November'. We seek to raise awareness and connection within the community for ALL babies admitted to neonatal units, regardless of cause. Our key event for Neonatal November will be our FREE Family Fun Day on World Prematurity Day at Bardon Park, Maylands on Saturday, November 17 from 10am to 2pm. We invite the entire community to come together in recognition of the day and celebration of 'Neonatal November'. Whilst this is a FREE event we would appreciate you registering. Those who register will be eligible for an event show bag (one per family, while stocks last) and also go in the running for an event door prize drawn on the day. If you are a business consider running a special promotion through November or just on World Prematurity Day where a percentage of sales or a specific dollar amount is donated to us for every purchase made. Contact us about including a sample product or promotional materials in our event show bags. Have a free dress day, or wear purple in your workplace on World Prematurity Day to show support and raise awareness. Consider collecting a gold coin donation. Have a ‘tiny bites for tiny sparks’ lunch, morning or afternoon tea in your home, workplace or school with proceeds as a donation. Light your home or workplace purple on World Prematurity Day and join the wave of purple light sweeping the globe at 7pm. Run you own fundraising event, garage sale, online auction, quiz, bingo, cake stall etc. Please contact us for support in advertising your event, promotional logos etc. Add a frame to your Facebook profile, search ‘tiny sparks wa’ to see the options available. 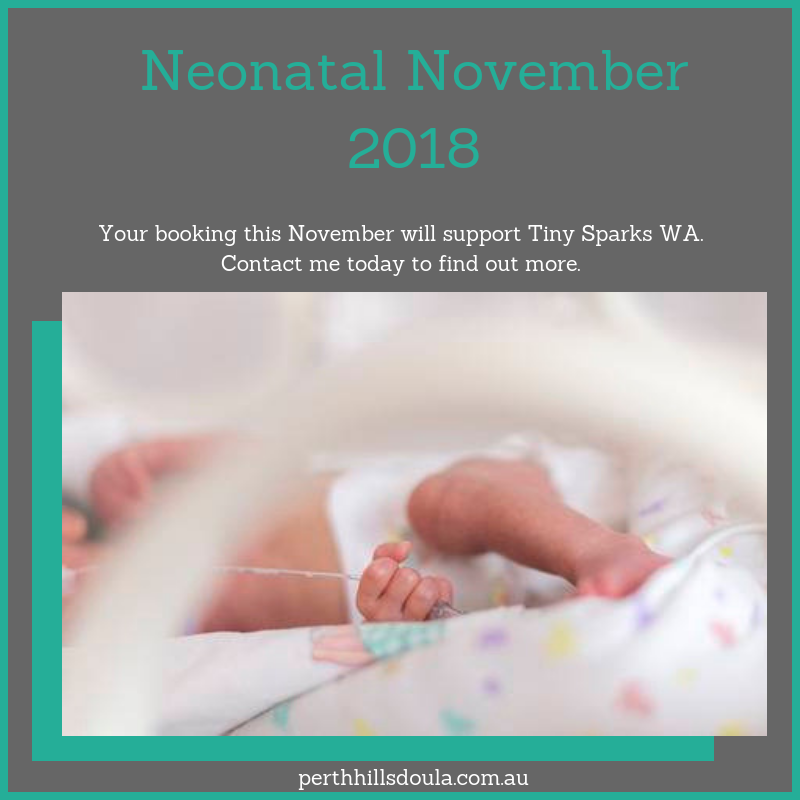 Some amazing WA businesses have thrown their support behind Neonatal November and we would love for you to show them some appreciation. Pure Luxe Candle Co - Use discount code ‘LIGHTITUPPURPLE’ for 15% off this exclusive World Prematurity Day candle and they are donating $2 from every sale. 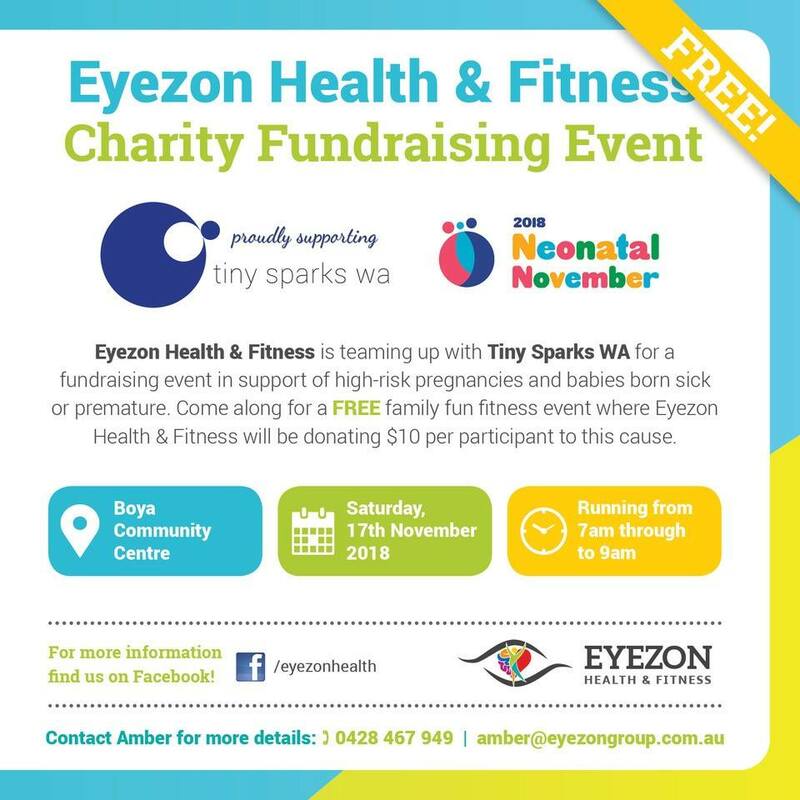 Eyezon Health & Fitness - Hosting back to back fitness classes on 17/11 at Boya Community Centre with $10 from every participant donated to. Loving Kreations - For Premmie keepsake dolls purchased directly through Loving Kreations over the month of November, $10 will be donated. 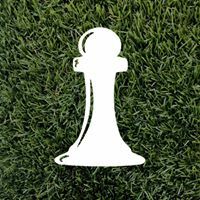 I Wet My Plants - donating 10% of all sales throughout the month of November. This is Danny. Danny is jumping out of a plane to raise funds for ‘tiny sparks wa’! Grace & Teddy - Pram tags with $2 from every purchase being donated in November.